50grms(2 ozs) of bright red, bright green, bright yellow. Small amount of cream for face and hands and black for eyes. Tapestry needle and tweezers to stuff bobbles. Worked at a tension of 26 stitches and 36 rows to 10 x 10cm over stocking stitch, using No.11(3mm) needles throughout. Cast off = Bind off. 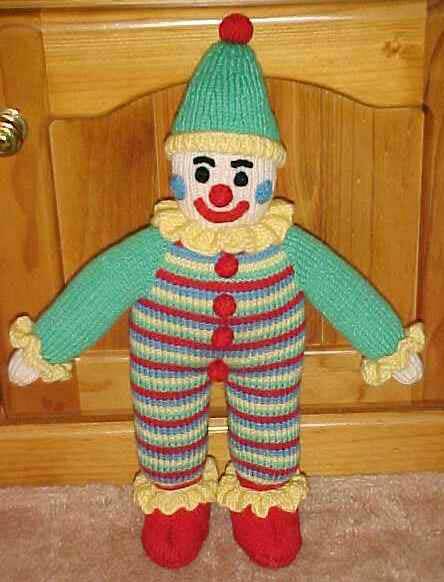 PLEASE NOTE: Work all seams in back stitch and stuff clown firmly unless stated other wise. # Using green yarn cast on 18sts and purl one row. 2nd row: Knit increasing into every st, (36sts). 3rd row: Purl. *4th row: Join in yellow yarn and knit one row. 5th row: Purl. 6th row: Join in blue yarn and knit one row. 7th row: Purl. 8th row: Join in red yarn and knit one row. 9th row: Purl. Repeat stripe sequence from * to ** 3 times. (35 rows)##. Leave these stitches on spare needle. Repeat right leg from # to ##. Joining row: Placing first coloured marker in first and last st, of next row, join in yellow yarn and knit 34sts, k2tog, across left leg and k2tog, knit to end of row of right leg (70sts). Continuing in stripe sequence ss, 38 rows. Neck: P3,( p2tog) to last 3 sts, p3, (38sts). Next Row: K9, (k2tog) ten times K9 (28sts). Break off green and join in cream and ss3 rows. Head: NR: K9, (inc, in each of the next 10 sts) k9 (38sts). Placing second coloured marker in first and last st, of first row, ss8 rows. 1st dec, row: K1, (k4, k2tog) to last st, k1 (32sts). NR: Purl. 2nd dec, row: K1, (k3, k2tog) to last st, k1 (26sts). NR: Purl. 3rd dec, row: K1, (k2, k2tog) to last st, k1 (20sts). NR: Purl. 4th dec, row: K1, (k1, k2tog) to last st, k1 (14sts). NR: Purl. 5th dec, row: K1, (k2tog) to last st, k1 (9sts). Leaving a long end, break off yarn and thread through sts. Using red yarn and starting at base, cast on 54sts and ss6 rows. NR: (k2, skpo) twice, k38, (k2tog, k2) twice (50sts). Cast off 8sts, at beg, of next 2 rows (34sts). NR: P15, p2tog, p2tog, p15, (32sts). Using red yarn, cast on 8sts for back edge, ss2 rows. NR: Inc, 1st each end of next row and 2 following 4th rows (14sts). Ss13 rows. NR: Dec, 1st each end of next row and following alternate rows (8sts). NR: Purl. Cast off all sts, for front edge. Using green yarn and starting at top of arm, cast on 10sts and purl one row. Starting with a knit row and working in ss, inc, 1st, at beg of next 12 rows (22sts). NR: Cast on 3sts, at beg, of next 2 rows (28sts). NR: (P2tog) to end of row (14sts). Leaving a long end, break off green and join in cream yarn and ss11 rows. NR: (P2tog) to end of row (7sts). Break off yarn and thread through sts. Using yellow yarn cast on 60sts and working in single rib (k1 p1) work 8 rows. Break off yellow and join in green yarn and ss 4 rows. 1st dec, row: (k4, k2tog) to end of row (50sts). 2nd dec, row: (k3, k2tog) to end of row (40sts). 3rd dec, row: (k2, k2tog) to end of row (30sts). 4th dec, row: (k1, k2tog) to end of row (20sts). 5th dec, row: (K2tog) to end of row (10sts). Break off green and join in red yarn and purl one row. NR: (inc, in each st) to end of row (20sts). NR: (K2tog) to end of row (10sts). Break off yarn and thread through sts. Using red yarn, cast on 10sts and ss5 rows. NR: (P2tog) to end of row (5sts). Using blue yarn cast on 10sts and knit one row. Break off yarn and thread through sts. Using red yarn cast on 14sts and cast off all 14sts. Using yellow yarn cast on 120 sts and knit 8 rows. NR: K2, (k2tog) to last 2 sts, k2, (62sts). NR: k1, (k2tog) to last st, k1, (32sts). Cast off all sts. Using yellow yarn cast on 60sts and knit 5 rows. Next row: (k3tog) to end of row (20sts). Using yellow yarn cast on 99sts and knit 5 rows. Next row: (k3tog) to end of row (33sts). Using red yarn, cast on 4sts and knit into every st, (8sts). Leaving a long end break off yarn and thread through sts. Body: Sew row ends together from first coloured marker to second coloured marker. Legs: Sew row ends together from cast on edge to first coloured marker. Stuff body through leg and head openings. Pull up the sts tightly at top of head and sew row ends together to 2nd coloured marker. Shoes: Uppers: Sew row ends together from cast on edge to cast off edge. Soles: Sew to the cast on edge of uppers. Stuff shoes firmly and pin the top of shoe to second row up of the cast on edge of legs. Hat: Sew row ends together from bobble to cast on edge. Turn hat to right side and stuff bobble. Pull up sts at top of bobble and sew in ends. Stuff the top of hat and place hat on head with the ribbing down. Sew hat to head through the 8th row of rib. Eyes: Thread the tapestry needle with black yarn and work one chain st in one st.
Work a second chain st around the first chain st. Work a third chain round the second chain st, two sts in length. Eyebrows: Using black yarn work a row of chain sts, above the eyes. Nose: Pull up sts, tightly and sew row ends together. Stuff nose and sew the cast on edge to face. Mouth: Pin the mouth to head and sew on. Cheeks: Pull up sts tightly and sew row ends together to form a circle. Sew cheeks to head. NECK: Thread tapestry needle with cream yarn and work a row of running sts round neck in the row below the increase for head row. Pull up yarn tightly to shape neck and sew in ends. Arms: Pull up sts tightly and sew row ends together to the cast on 3sts edge. Stuff arm and sew to body with the top of the arm at the top of the second stripe down from neck. The lower edge of armhole, the 3st, edge should be sewn to the body at the second green stripe down from neck. Ruffles: Place neck ruffle round neck and sew row ends together. Sew the cast off edge to neck. Place wrist ruffles round wrist and sew row ends together. Sew the cast off edge to the top row of hand. Place Ankle ruffles round ankles and sew in row ends. Sew the cast off edge of ruffle to the second row down from top of shoe. Bobbles: Sew the cast on edge and row ends together. Turn bobble to right side and stuff bobble. Pull up sts tightly and sew in. Sew bobbles to the yellow stripes on the front of body.